When you feel like taking Yam Rice in Penang island, you will normally ended up at Yong Tau Foo stalls or stalls that sells Pig Stomach Soup, Egg Soup, Cabbage Soup and so on. 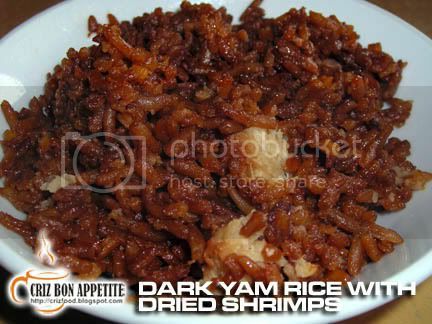 Most of the time, you do not even see any yam or dried shrimps in the rice. I have frequent this specific Yam Rice stall right in Chai Leng Park, mainland Penang for the past eight years or more and the standard still maintained the same. Each time I am in mainland, I will visit this stall without fail regardless of eating in or takeaway. Why not? It is the best Yam Rice I have taken in Penang. Who knows? It might be the best in Malaysia too. Together with a client of mine (my Chinese clients will always end up with me here. :P), I visited the place again. 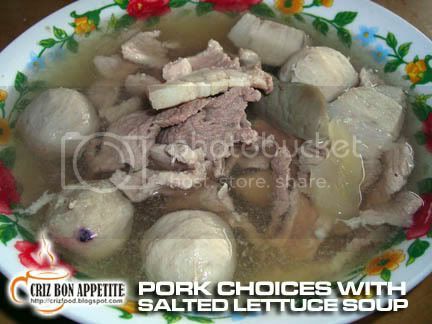 As usual I will order the big bowl of Salted Lettuce (Kiam Chai) Soup with my own selection of lean meat, belly meat, pig stomach and meat balls. 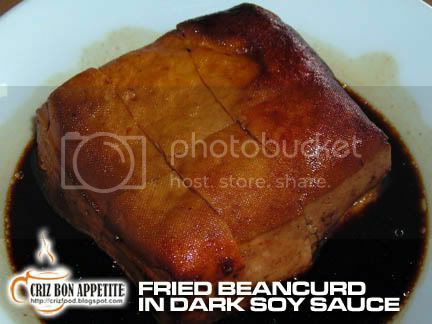 You can even add in other parts such as intestines, liver and so on. 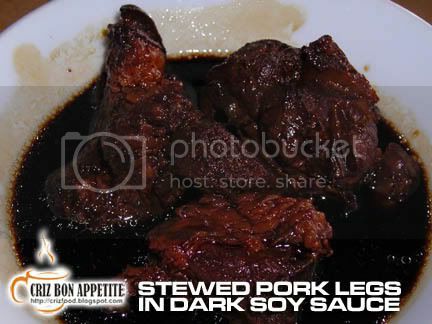 The soup, a bowl of Stewed Pork Legs and Beancurd in Dark Soy Sauce and 4 bowls of yam filled rice cost us only RM13.40. Don’t you think that’s really cheap? 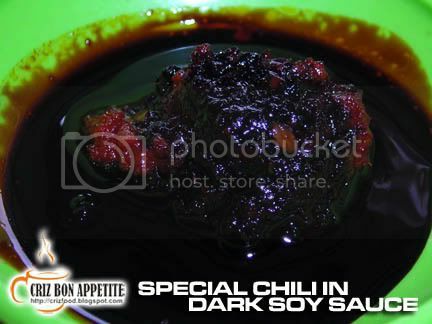 By the way, their combination of specially prepared chili paste in dark soy sauce really blends in well with the rice. Here are what we ordered. If you are coming from the Butterworth Ferry Terminal, just turn right as you come up to the traffic light junction and drive towards the “mini Penang Bridge”. You have to pay a toll of RM1 if you are driving a car. Just follow the sign to Prai and Chai Leng Park towards Megamall/Pacific. If you are coming from the Penang Bridge/North-South Highway, turn into Jalan Baru where Megamall/Pacific is, drive towards an overhead bridge and make a U-turn to reach Chai Leng Park. When you see Pearl View Hotel on your left, turn left into the junction (Jalan Kurau). Turn left at the first junction, right at the first junction and right again into Lebu Kurau Satu. You will see the stall on your right in Kedai Kopi Chin Heng. The stall is in between another Yam Rice stall (I have tried before but not as good as this one. Just follow where the most crowds are. They are usually not wrong) and a vegetarian restaurant. You can also visit their other branches (call up and enquire where about) in Jalan Raja Uda and Bukit Mertajam areas. All of them carry the same name “BM Yam Rice”. 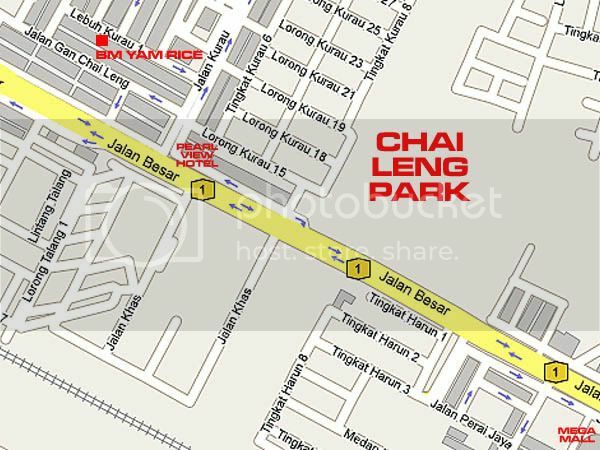 Address: 45 Lebuh Kurau Satu, Chai Leng Park, 13700 Prai, Penang, Malaysia. fantastic! thx for the directions. when i am in penang i always wonder what to eat:) .. now i know ! why you call this BM Yam Rice?? I thought it was in BM, but actual fact it’s in Chai Leng Park. this is my classmate’s father’s shop. before they were into yam rice biz, the father was used to be another shop (also in Chai Leng Park) selling Koay Teow Th’ng. 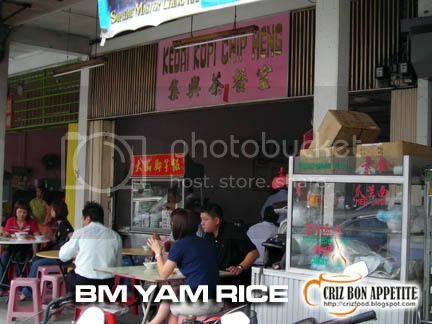 you are right, this is the best yam rice in Penang!!! oh the famed yam rice. read about this somewhere. My favorite spot for yam rice. the portion look quite good. nice!